Discover millions of titles all just a click away. Go to My NOOK at the top of your screen and sign-in. If you don't already have a nook account, you can create one here. 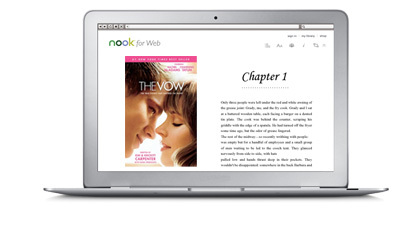 Any new samples you've added from NOOK for Web will be added to your Library. You can easily read them later on your NOOK, NOOK for Web, or on other mobile devices with free NOOK Reading Apps. Once you've finished a sample, easily buy the books you love, then keep reading - right in your browser. Read any books already stored in your NOOK Library right from the Web. Simply click on your current read and pick up right where you left off.